Place squash cut side down on a shallow baking sheet. Roast for 40 to 45 minutes or until very tender. Meanwhile saute the onion and ginger in olive oil in a 4- quart Dutch Oven until the onion is tender. Add the broth; cover and simmer for 10 minutes. Stir in beer and salsa. Scoop the cooled squash from the skin and stir into the broth. Place half of the soup mixture in a blender* and puree. Repeat with remaining soup mixture. Return soup to the Dutch Oven and heat until ready to serve. Garnish each serving with a spoonful of salsa, dollops of sour cream and a dusting of cumin. 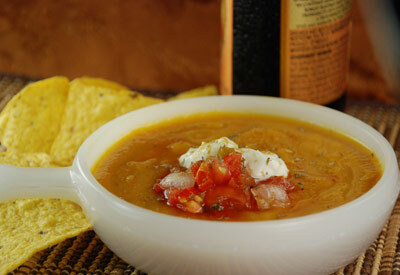 *An immersion blender can be used to puree the soup in the Dutch oven rather than using a standard blender.